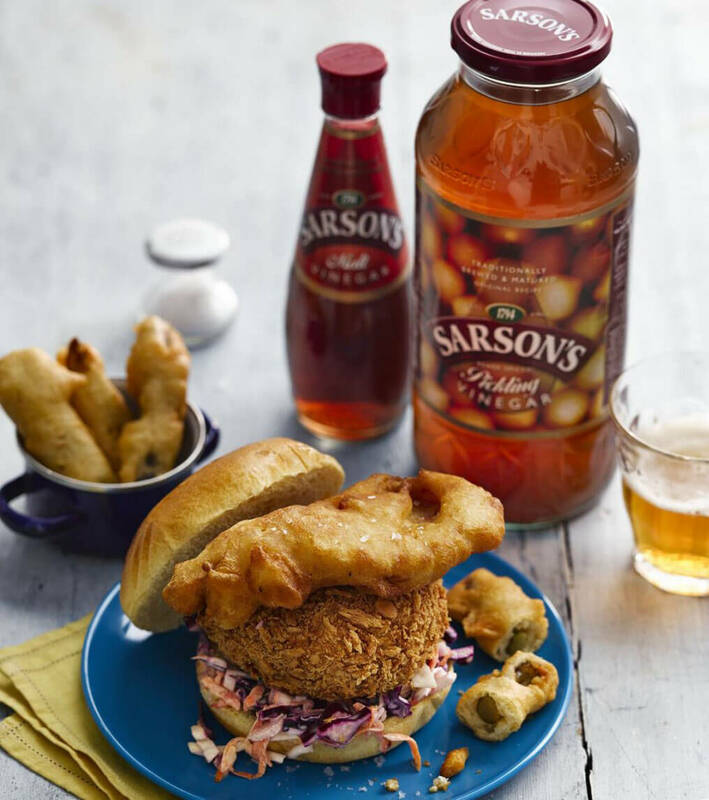 We recently partnered up with the pickling purveyors of versatile vinegars… Sarson’s to showcase how we use their products in our Shell L Cool J Louisiana spiced crabcake and battered gherkins recipe.The Hip Hop Chip Shop – Shell L Cool J Crab CakeCrab Cake Ingredients. The liquor should be 1 part sugar to 2 parts Sarsons white wine vinegar to 0.5 parts water, add the rest of the ingredients (excluding the gherkins) to a pan and bring to the boil. Pour the liquid and add the Gherkins into a sterilized Kilner Jar. Infuse the liquor with the Gherkins for 2 weeks for maximum flavour. Mix plain flour with a Sarsons Malt Vinegar, salt, baking powder, soda water (or you can use beer), when the batter is ready it should be smooth and completely lump free. Slice the gherkins into strips or batons and drain off excess liquid, then flour and submerge in the batter mixture till completely covered. Let the batter drip off till there is a thin layer of batter mixture coating the gherkin. Carefully place into a deep fat fryer at 180 degrees, the gherkin will float on the surface of the oil and when golden brown place the gherkin on kitchen roll to drain off any excess fat.